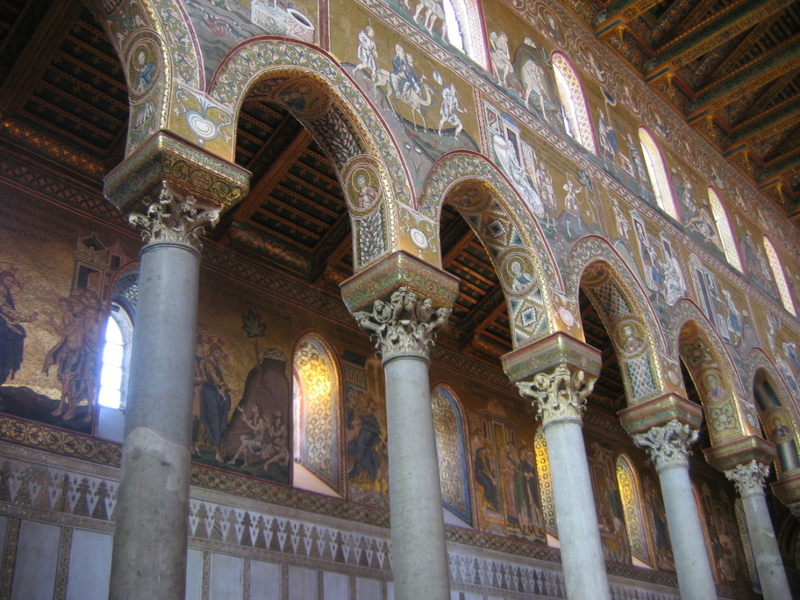 The original definition of basilica is as an architectural style. This term dates from just before Christ’s birth, and is an artifact of the Roman Empire. Basilicas were initially built as a place for public gatherings. Anything from marketplaces to army training could occur here. These buildings would frequently have high walls and large open spaces for audiences and transactions. Constantine the Great Christianized the Roman idea of a basilica into its modern day Christian architectural version. When looking at the types of architecture available, the basilica style caught his eye, partially because the style of the pagan temples that dotted the countryside were, well, associated with pagans. Christianizing basilicas didn’t change much in terms of their architectural content. Rather, they were built for the glory of God (and as a legacy to Constantine). 1) Propylaeum- the entrance building of a sacred precinct, whether church or imperial palace. 2) Atrium- in early Christian, Byzantine, and medieval architecture, the forecourt of a church; as a rule enveloped by four colonnaded porticoes. 3) Narthex- the entrance hall or porch proceding the nave of a church. 4) Nave- the great central space in a church. In longitudinal churches, it extends from the entrance to the apse (or only to the crossing if the church has one) and is usually flanked by side aisles. 5) Side Aisle- one of the corridors running parallel to the nave of a church and separated from it by an arcade or colonnade. 6) Crossing- the area in a church where the transept and the nave intersect. 7) Transept- in a cruciform church, the whole arm set at right angles to the nave. Note that the transept appears infrequently in Early Christian churches. Old St. Peter’s is one of the few example of a basilica with a transept from this period. The transept would not become a standard component of the Christian church until the Carolingian period. 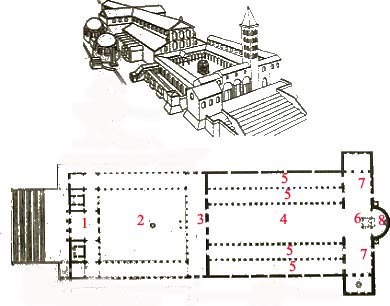 One of the most notable features of a basilica is the clerestory, which is a second level area formed by the central nave being taller than the aisles. This creates a higher roof along the center of the basilica, and typically causes the sides to be buttressed. The clerestory is usually lined with windows, bringing in a great deal of natural light. Perhaps the most famous architectural basilica is the Basilica of Maxentius and Constantine. Found in Rome, this basilica was started by Emperor Maxentius (a pagan) and finished by Emperor Constantine (a Christian) after he defeated Maxnetius. So that’s a quick overview of the architectural meaning of basilica! Next week I’ll be going over the ecclesiastical meaning, which is the more common usage seen nowadays. If you have questions about architectural basilicas, or perhaps more insight into them, share it in the comments! Information obtained from Wikipedia, Catholic Encyclopedia, and The Romanization of Christianity and the Christianization of Rome: the Early Christian Basilica.